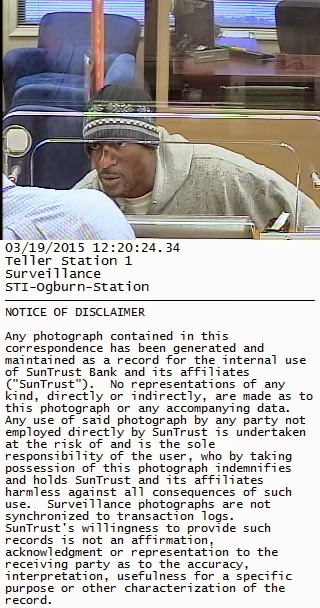 "Today at 12:25 p.m. officers with the Winston-Salem Police Department responded to the SunTrust Bank at 4306 N. Liberty Street to a reported bank robbery. The suspect, described as a black male, 35-45 years old, wearing a gray hooded sweatshirt and a blue toboggan, entered the bank and demanded money. After obtaining an undisclosed amount of money, the suspect fled on foot. There were no injuries during the robbery. This case is being investigated by the Criminal Investigations Division. Anyone with information regarding the incident is asked to call the Winston-Salem Police Department at (336) 773-7700 or CrimeStoppers at (336) 727-2800."